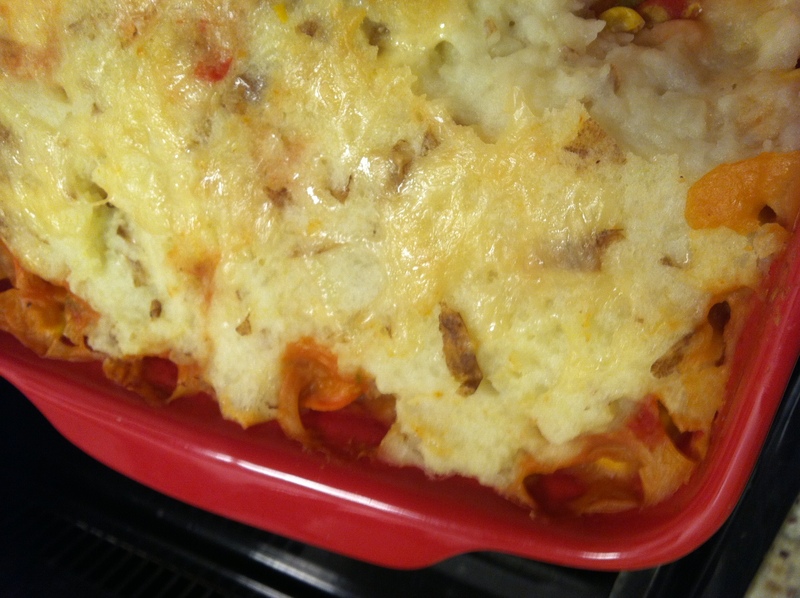 When I was little, my mother made a kind of quick shepherd’s pie. We would smoosh mashed potatoes down on our plates with our forks, add hamburg and gravy on top, and pile it high with corn. Then, we would mix it all around until it was a jumble of corn, potatoes, and hamburg. I always liked this dinner and wanted to find something as equally comfort food-ish that was vegetarian. I found it in my College Vegetarian Cookbook and have slightly tweaked it until it’s just perfect. First we boiled the potatoes for the mashed potatoes that will top the shepherd’s pie. I left the skin on because that is where almost all of the potato’s nutritional value is found. While the potatoes are boiling, cut the carrots, onion, and green beans. Place 3/4 cup of water and the boullion cube (or Better than Boullion) in a large sauce pan and bring to a boil. Add the carrots, onion, green beans, corn, and 2 chopped garlic cloves, and cook for about 15 minutes, until the carrots are tender. Remove the pan from the heat. Drain the can of tomatoes and add it to the vegetable mixture. Next add the can of cannellini beans with their liquid. In a small bowl, combine the soy sauce, flour and remaining 1/4 cup of water and stir until smooth. 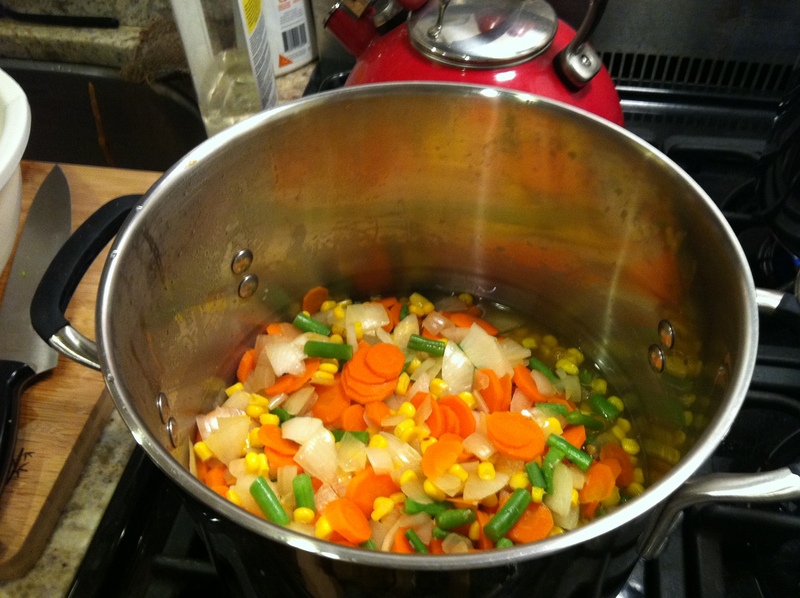 Pour the liquid slowly into the vegetable mixture, stirring constantly. The sauce will thicken slightly. Season with salt and pepper. Add the milk, butter, and remaining 2 cloves of garlic to the potatoes and mash. You can also add cheese, if you’d like. We added a ton of cheese, of course 🙂 Pour the vegetable/sauce mixture into a casserole dish. Spoon the mashed potatoes over the top and smooth until they completely cover the vegetables. If you’d like, add more cheese on top. Bake for 45 minutes at 350 degrees, until the potatoes are slightly brown.